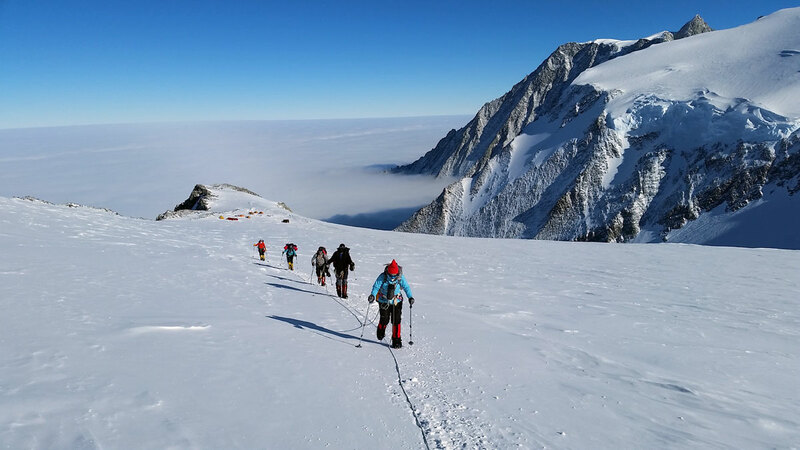 During this 18-day adventure to the summit of Vinson Massif (16,067 ft.) you will be carrying a backpack and pulling a sled laden with 10 days’ worth of gear and food. Be prepared to face very cold temperatures despite full-time daylight. 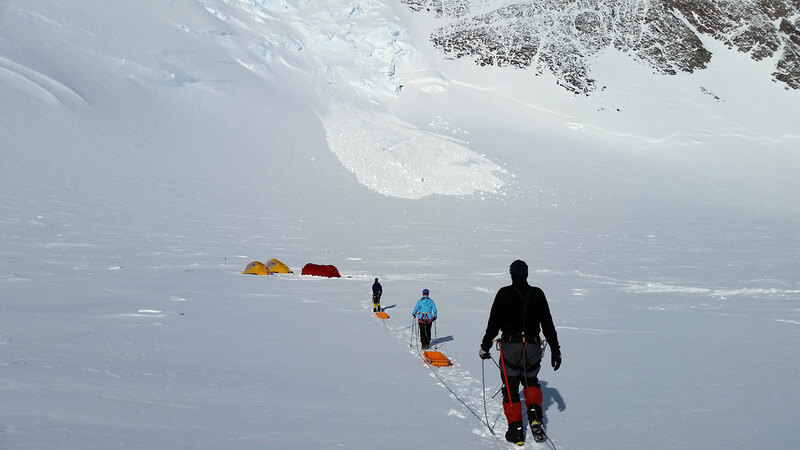 The climb requires use of ascenders and fixed lines between Camp I and II over a 40-degree slope for 1,800 ft., and you can expect a long 12-hour summit day, during which you will gain 3,600 ft. of elevation to reach the summit. 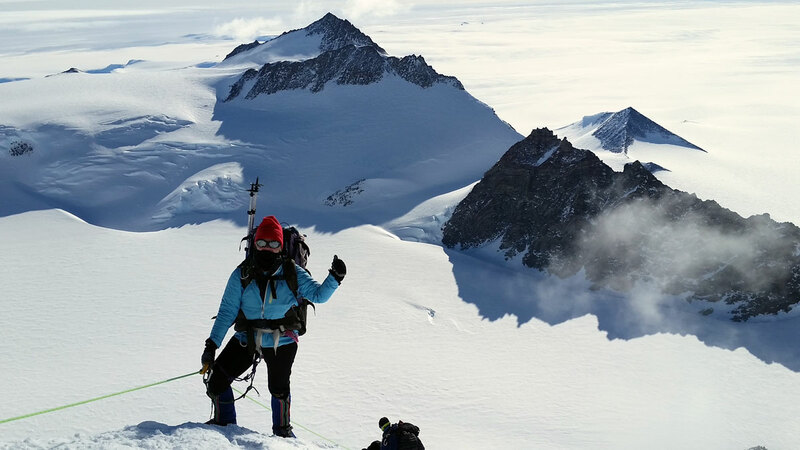 In addition to solid alpine snow and ice climbing skills, you need strength, endurance, high-altitude tolerance, and strong cardiovascular conditioning. 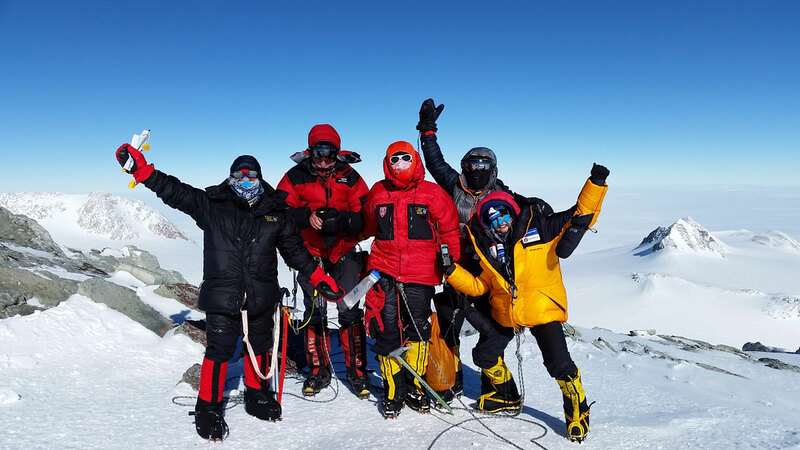 Just because you exercise regularly (four to six times per week) does not mean you have the conditioning needed to reach the summit of the coldest continent. 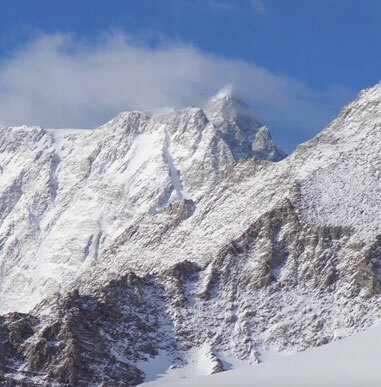 Plenty of people who have the endurance to run a marathon fail to summit high-altitude peaks. Pure cardiovascular fitness is simply not enough. You should focus on building physical conditioning necessary to ascend 3,500 ft. of elevation on successive days carrying up to 45 lbs. 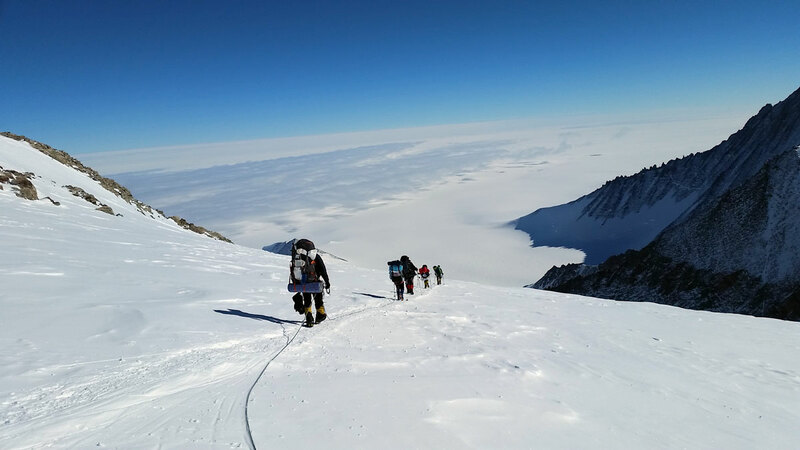 Most people will need to train specifically for their climb of Vinson for at least 4–5 months, building up from a solid baseline of fitness. During your training, you will need to progressively ramp up your hike time, distance, and elevation gain (at roughly 10% per week) to safely and effectively build your climbing-specific conditioning. Trying to rush this will increase the risk of experiencing some sort of training injury and not being ready for your trip. Below are more details of how to incorporate these four priorities into your training program. 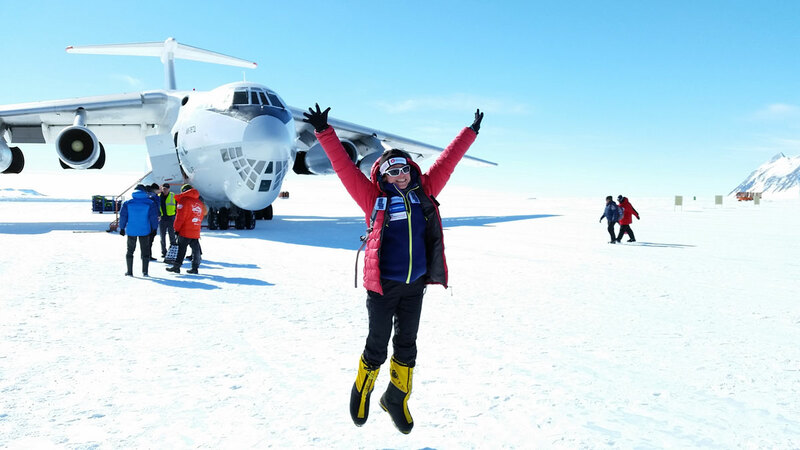 Vinson, at 16,067 ft., is an extreme, high-altitude climb. You should be comfortable climbing eight hours per day. 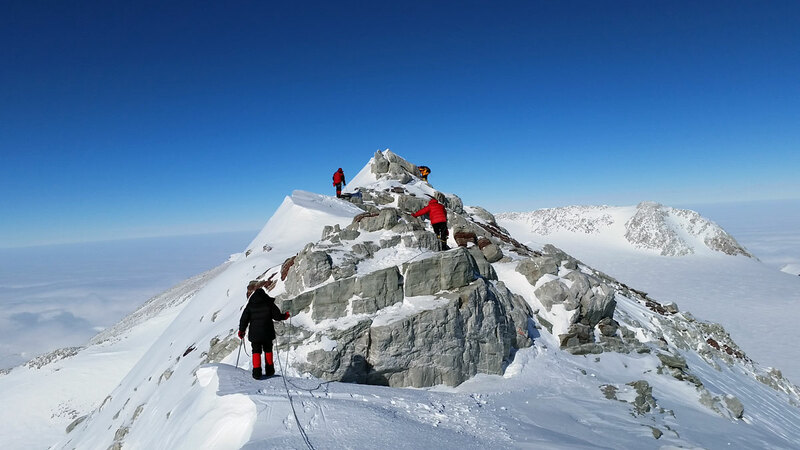 Summit day is the most demanding portion of the climb, typically involving eight hours for the ascent and three to five hours for the descent. Generally you carry 35 pounds in a backpack and 25 pounds on a sled. 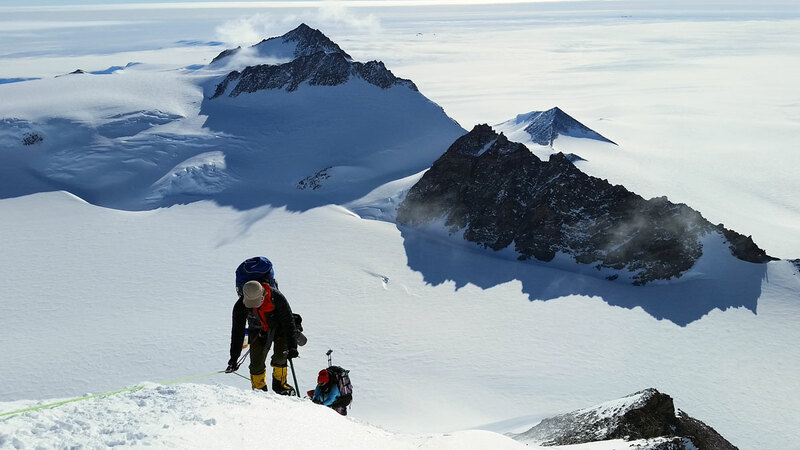 Alpine Ascents is one of the few outfitters allowed to cache at Vinson Base Camp, Low Camp, and High Camp, and thus we have a full set of cookware, stoves, tents, and climbing equipment. This greatly reduces the pack weight that climbers need to carry (now 45 lbs.). This substantially changes the climb, in that much less weight will need to be carried by Alpine Ascents groups. 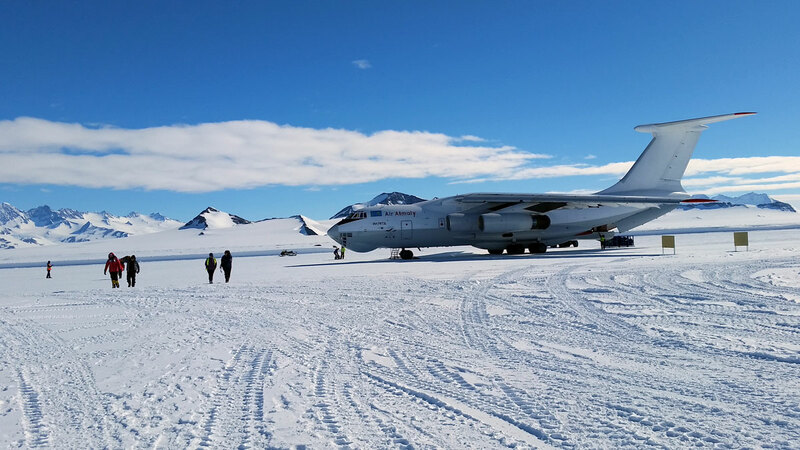 Our expeditions require strength and endurance. The better your physical condition, the more likely you are to perform well and have an enjoyable experience. 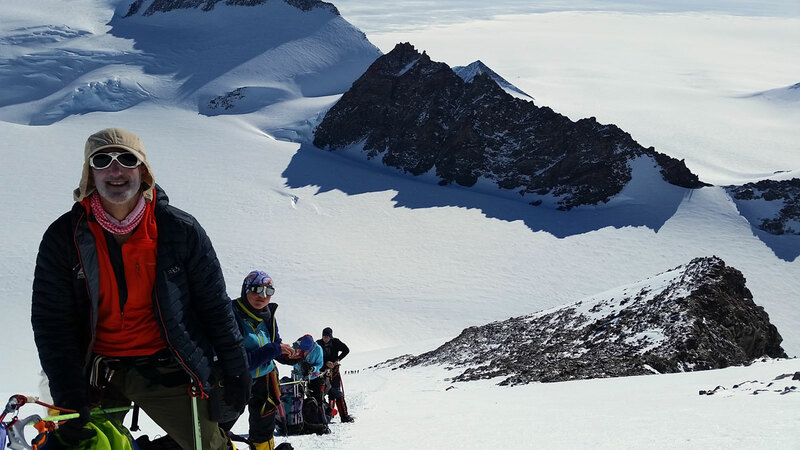 The most frequent comment we have heard over the years is that climbers have underestimated the fitness level needed to fully enjoy their trip. Inadequate fitness will affect the atmosphere, pace, and enjoyment of the climb for all participants. We recommend checking with your physician before undertaking any strenuous activity. Hike along outdoor trails, gradually increasing your pack weight until you feel comfortable carrying a 45 lb. pack. If you live where it is relatively flat, go up and down stairs or train on an inclined treadmill or StairMaster. Use whatever varied surface terrain (i.e. gravel beds, sand dunes, river banks) you have access to. A reasonable goal would be to ascend 3,000 ft. carrying an average pack of 30 lbs. in a three-hour period, or roughly 1,000 vertical ft. per hour. A good training option for pack weight is to carry water in gallon containers or collapsible jugs so you can dump water at the top as needed to lighten the load for the descent. In early season, start with a hike that gains up to 2,000 ft. elevation over 5–7 miles round-trip, and carry a 20-lb. pack; each hike try adding three to five lbs. until you are comfortable with a 40-lb. pack, then begin increasing the total elevation gain and mileage. When you can gain 3,000 ft. while carrying a 40-lb. pack, start decreasing rest breaks and increasing speed on each conditioning workout. A month from your climb, you should be comfortable hiking on successive days with at least 40 lbs. on one of those outings. 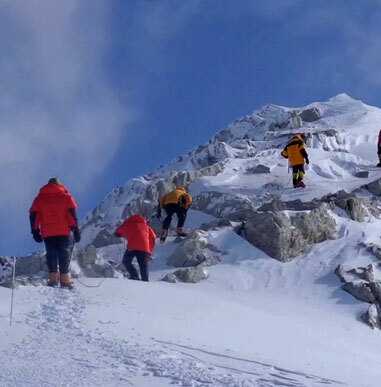 Two training techniques that will be useful for high-altitude trekking are: 1) Interval training. 2) Back-to-back training (discussed in more detail in Putting it All Together) To include interval training, find a steep hill or sets of stairs that will allow you to climb steadily for several minutes. Push as hard as you can going up, then recover coming down, and repeat for anywhere from 20–45 minutes depending on how close to your climb you are. Gradually add weight to your pack (no more than 10% per week) until you can carry 30 lbs. the entire time. Another form of interval training that is useful for this particular climb is loading a child’s sled with weight or rigging up a large rubber tire and dragging it back and forth across a lawn or snowfield. This will show you what muscles you will want to strengthen for sled-pulling up to 35 lbs. 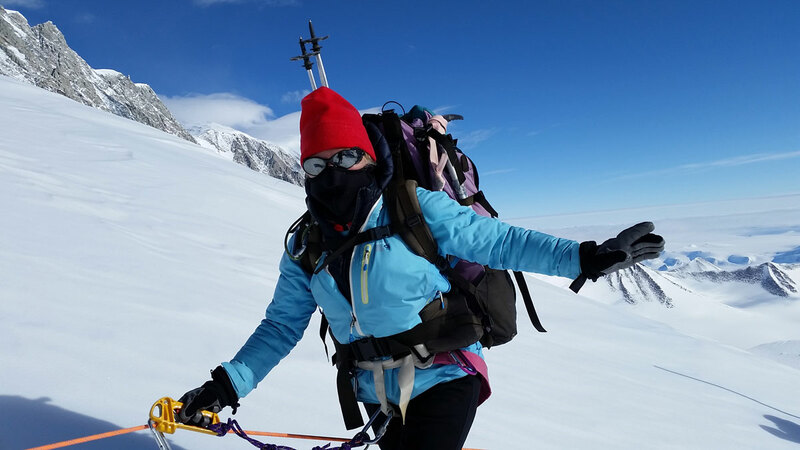 If possible, participate in as many hikes at altitude — and in winter conditions — as you possibly can to learn how your body reacts in extreme cold and above 13,000 ft. elevation. Be sure to include at least 5–10 minutes of targeted stretching following every workout, specifically for the hamstrings, glutes, hips, calves, forearms, lower back, and quadriceps. If you have any areas of concern early season, add emphasis to making sure you have normal range of motion about all your joints. This will become even more important as you add weight and distance to your conditioners. Training with free weights, bands, a backpack, body weight exercises, or gym machines will help you build overall strength, particularly in the core (lower back and abdominals), upper back and shoulders, and legs. Developing strength in your upper back and shoulders will help you with such tasks as carrying your pack and using trekking poles effectively. The calves, hips, quads, hamstrings, and glutes are all involved in ascending and descending steep, hard-packed snow and ice slopes (up to 30 degrees), and a great degree of strength endurance is required in all areas of the legs and hips, especially during those segments when you will be carrying a pack and pulling a sled. Training primarily with free weights will give you the functional, climbing-specific strength that will help you most in the mountains. Free-weight training requires that you balance the weights as you would your own body: weighted with a pack, in three-dimensional space. When starting any strength conditioning program, complete two full-body strength workouts a week for 45–60 minutes each, focusing on compound exercises such as squats, lunges, step-ups, dips, pull-ups, rows, dead lifts, bench presses, pushups, and overhead presses. In the beginning phase of strength conditioning, focus on building a foundation for harder workouts; to that end, keep the weight light enough to concentrate on good form and complete two sets of each exercise for 8–10 repetitions. As you continue to train, you will shift focus to building strength (generally lower reps, five to eight, with heavier weight). Four to six weeks before your climb, shift your training to focus on strength endurance (higher reps, 10–15, with light weight) to turn the newly gained strength into greater strength endurance. Each training phase should vary the weight used, repetitions completed, number of sets, and rest intervals. Regardless of training phase, always be sure you maintain proper form in order to prevent injury or strain. Include spinal-loading aerobic training options three to five times a week. Appropriate options include trail running, walking on an inclined treadmill, doing stair stepping or step mill training, jogging, working on an elliptical machine, walking up and down hills, or participating in step aerobic classes. While biking, rowing, and swimming are aerobic options for the earliest stages of training, be sure as you get closer to your trip that you include activities suggested above that load the spine and legs the same way that hiking will. When first beginning a cardiovascular training program, begin with three weekly workouts of 30 minutes of sustained activity at a moderate intensity, and build to four to five aerobic sessions of sustained effort for at least 45–60 minutes. Be sure to include a 5–10-minute gentle warm-up before working at your target heart rate for the day (for most workouts, choose a level of exertion that allows you to connect a few words together in a phrase, but leaves you feeling comfortably tired at the end of the workout), and cool down with 5–10 minutes of appropriate stretching of the muscles you use most in your activity, including lower back, calves, hamstrings, hips, and quadriceps. Roughly a month before your climb, you should be at the conditioning level where you are comfortable hiking on consecutive weekend days, what is referred to as back-to-back training. This involves hiking with your target climb pack weight (45 lbs.) on the first day for at least 3,000 ft. gain, and a somewhat lighter pack (20 lbs.) for greater mileage or elevation gain on the second day to simulate the back-to-back requirements of long days on your trip. This will not only be helpful physically, but also prepare you psychologically for the challenge of repeat high-effort days without any recovery days in between. A sample week of training a month prior to your climb might look like the chart above in an effort to help you build as much stamina as possible. Be sure to include at least one recovery day per week and listen closely to your body. Take the final week to taper or gradually reduce intensity and volume of training so that by the time you leave for your trip you are well rested and physically and psychologically up to the challenge. This training information was provided by wilderness sports conditioning experts Courtenay and Doug Schurman of BodyResults.com. 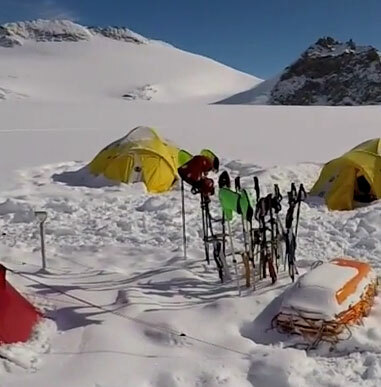 They are the exclusive conditioning resource for Alpine Ascents. 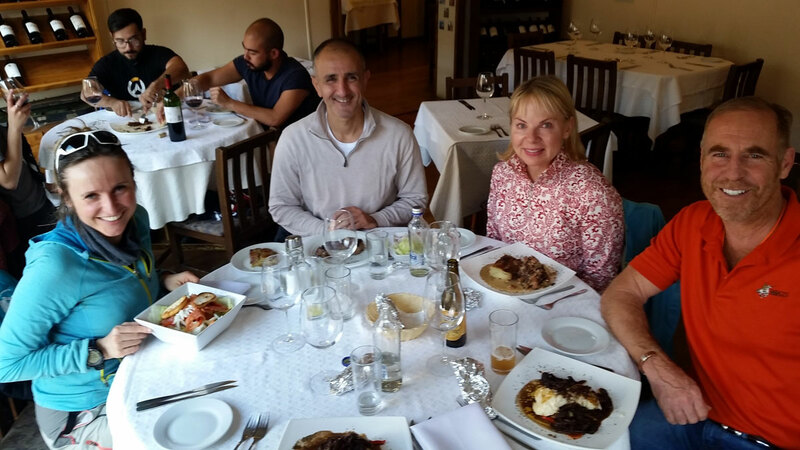 They oversee all client training, are co-authors of the book, “The Outdoor Athlete” (2009) and are creators of the “Train to Climb Mt. Rainier” DVD. Full body, 12–15 reps per set, 45–60 min. Full body, 8–10 reps per set, 45–60 min. Hike 8–10 miles, 45-lb. pack, gain 3,000 ft.